What Day Of The Week Is August 7? 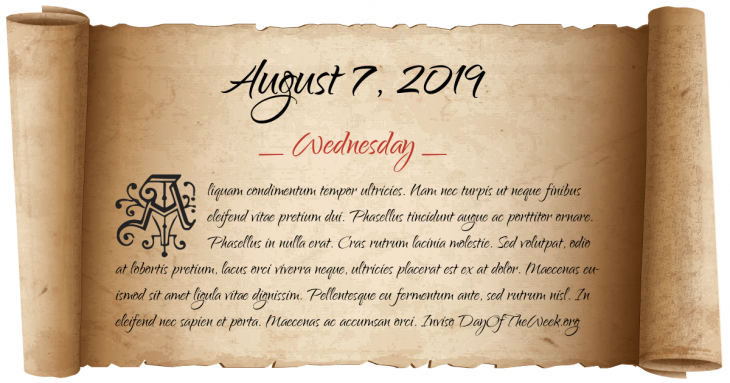 August 7, 2019 is the 219th day of the year 2019 in the Gregorian calendar. There are 146 days remaining until the end of the year. The day of the week is Wednesday. The Northern Hemisphere is considered to be halfway through its summer and the Southern Hemisphere half way through its winter on this day. Roman Emperor Majorian is beheaded near the river Iria in north-west Italy following his arrest and deposition by the magister militum Ricimer . The Visconti of Milan’s fleet is destroyed by the Venetians on the Po River. The Ming Dynasty Chinese military general Cao Qin stages a coup against the Tianshun Emperor. George Washington orders the creation of the Badge of Military Merit to honor soldiers wounded in battle. It is later renamed to the more poetic Purple Heart. Simón Bolívar triumphs over Spain in the Battle of Boyacá. The Simele massacre: The Iraqi Government slaughters over 3,000 Assyrians in the village of Sumail. The day becomes known as Assyrian Martyrs Day. World War II: the Battle of Guadalcanal begins – United States Marines initiate the first American offensive of the war with landings on Guadalcanal and Tulagi in the Solomon Islands. Philippe Petit performs a high wire act between the twin towers of the World Trade Center 1368 ft in the air. U.S. President Jimmy Carter declares a federal emergency at Love Canal due to toxic waste that had been negligently disposed of. Who were born on August 7?